In the transition from summer to fall and fall to winter, the cheery brightness of summer morphs all too quickly into the drabness of cold winter days. Before we know it summer has flown by and our crisp autumn adventures in the array of colorful falling leaves fades. So as the days become shorter and chilly we welcome the advent of the Christmas season with strings of light decorating our houses, yards, banisters, mantles, and Christmas trees. We add electric candles in our windows and burn lovely Christmas scented candles all over our houses. It’s as if the dreariness of the season demands more light. 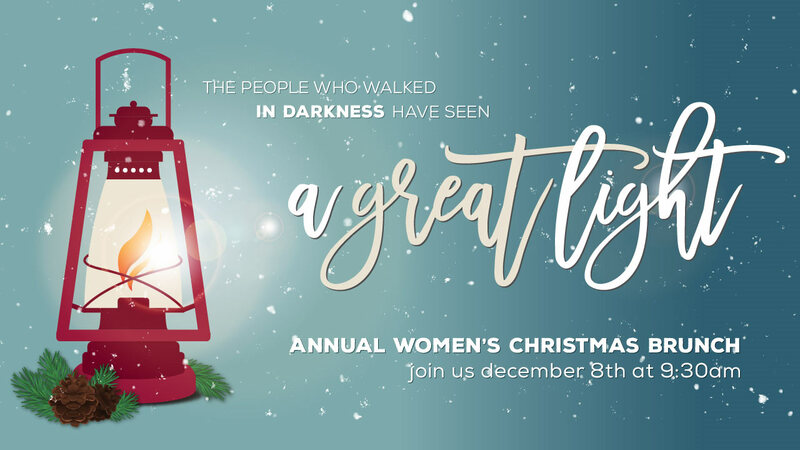 On December 8 at 9:30 a.m., you are invited to join us as we hear from Cheryl Ryan, who will explore these themes of darkness and light throughout Scripture both in our physical world and our spiritual life. You won’t want to miss hearing how these themes might impact your holiday season and traditions. No matter what kind of darkness you have or may be struggling with, the Light always overcomes the darkness. Jesus is our Great Light and we will look to Him in a bright, glorious, and unique way this Christmas season. Invite your friends and neighbors and join us for this special annual event! Coffee, tea, and a wonderful catered breakfast will be served. Cost is $15.00 and doors open at 9:00 a.m. so come early to grab your seat and settle in for our cozy women’s brunch. We can’t wait to see each of you there!